A “lame duck” Prime Minister had just lost a General Election. He was meeting with his successor in No. 10 Downing Street for an informal handover. Near the end of the orientation, he gave the incoming leader three numbered envelopes. He suggested they be opened, in order, on the anniversary of their meeting, or at times of national crisis. After the new Prime Minster had enjoyed his “honeymoon” year with the media and the public, the nation experienced something of an economic downturn. Curious, and beginning to feel lonely and isolated, he opened the first envelope. Inside was a card with two words: “Blame me.” So he did, criticizing the former Prime Minister for the countries woes. By the second anniversary, demonstrations and strikes had brought the country to a standstill. The Prime Minister eagerly opened the second envelope. Inside there were two words on the card: “Blame my administration.” So he did, blaming the unrest on the failed policies of the previous government now in opposition. About a year later, foreign policy blunders were leading to tensions in Europe and the Commonwealth and his popularity in the polls was plummeting. The Prime Minister reached for the third envelope desperate for a solution. Inside, the card read: “Prepare three envelopes.” Someone once said, “He who smiles in a crisis has found someone to blame. Some enterprising businessperson will sooner or later register the domain name “Rent-a-Scapegoat.com” with the motto “Mea Culpa.” Here’s what the homepage might offer. Let’s be honest. How many of us would be tempted to use that kind of service, if it existed? Especially, if they did house calls as well as business consulting? But seriously, is it not instinctive? When we come under the spotlight, we look for someone to blame, someone to pass the buck, someone to take the rap, a scapegoat? Where did this idea of the scapegoat come from? The term goes way, way back to Leviticus 16 when God introduced an annual festival called the Day of Atonement. Known as Yom Kippur (in September), it became the most solemn day in the Jewish calendar, a day of national mourning, of humiliation, of fasting, repentance and forgiveness. Yom Kippur is still observed today as a solemn Sabbath, but without the sacrifices because there is no Temple. Every year on that day the High Priest bore the heavy burden. He became for one day, the mediator between God and His people. Every year on this special day the responsibility was all his. He had do to it alone. No one else was allowed to be with him. He entered the Holy of Holies alone, wearing special clothes and carrying a bowl of blood. He offered a sacrifice to atone for his sin and of his people. So sacred and so terrifying was this holy place, the people tied little bells to the High Priests clothes so that they could hear if he stopped moving. And they tied a rope to his leg so that if he fell ill, or died while in the Holy of Holies, they could drag him out. In the New Testament, the writer to Hebrews draws on Aaron’s role and compares him with Jesus. .
Aaron entered the earthly tabernacle, Christ entered the heavenly tabernacle. Aaron offered for the whole nation Christ offered for the whole world. Jesus is indeed our great High Priest. Aaron brought two goats to the entrance of the tent of meeting. There the fate of each goat was determined by lot. One would die, the other would live. The first goat was sacrificed to show how seriously God views sin, that sin leads to death. But he was pierced for our transgressions, he was crushed for our iniquities; the punishment that brought us peace was on him, and by his wounds we are healed. We all, like sheep, have gone astray, each of us has turned to our own way; and the LORD has laid on him the iniquity of us all. (Isaiah 53:5-6). The Apostle John describes Jesus as the atonement sacrifice. Jesus then is our High Priest. Jesus is our Atoning Sacrifice. The first goat represented the atonement for sin. The second goat symbolised what had happened to their sin. The High Priest had to place His hands on the head of the scapegoat, and confess all the sin and rebellion of the people. Then the goat was led out into the wilderness. This symbolised the removal of the people’s sins as far away as possible. The Psalmist must have had the scapegoat in mind when he wrote, “as far as the east is from the west, so far has he removed our transgressions from us.” (Psalm 103:12). As the scapegoat grew smaller and smaller and finally disappeared into the wilderness, the people had assurance that their sins had been atoned for. The first animal represented the fact that God had forgiven their sins. The second animal indicated that now God had forgotten their sins. Forgiven and forgotten, the two go together. If it is not forgotten, it is not forgiven. But in Jesus Christ, our sin is forgiven and forgotten. In Jesus Christ, sin has been banished to a barren and uninhabitable place where it belongs. The word translated wilderness is ‘Azazel’ in Hebrew. It means much more than simply the desert or wilderness. The desert was also thought to be the place where demons and evil powers lived. Mark Braverman is a Jewish American friend. We were speakers at two conferences in Amsterdam this week. When I told Mark the theme of my sermon today, he said that in contemporary Hebrew, the word Azazel is used for hell. So in Hebrew you might say “Go to Azazel”. 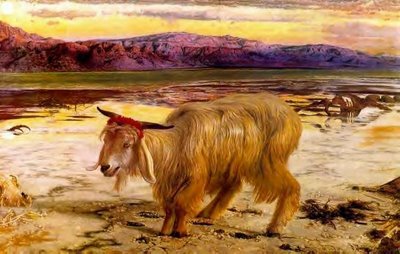 I wonder if this image of the scapegoat is to be found in an event that occurred at the beginning of Jesus ministry, when the Spirit of God drove Jesus into the desert to be tested by Satan (Matthew 4:1-11). Or perhaps after his death when he went to Hades to preach to the departed? (1 Peter 3:19-20). It is surely no coincidence that it was in the desert that John the Baptist cried out when he saw Jesus ““Look, the Lamb of God, who takes away the sin of the world!” (John 1:29). Did John see Jesus as the scapegoat? This is why Jesus death at Calvary is called the sacrifice of atonement – because he covers all our sin. The Book of Leviticus develops more emphatically than either Genesis or Exodus, the fact that the blood, represents life. That is why the blood of Christ is the foundation of everything. Like the story of Abraham who almost sacrificed Isaac in Genesis, and the Passover lamb sacrificed in Exodus, the image of the two goats offered on the Day of Atonement in Leviticus, point to Jesus. To Jesus who would make further sacrifices unnecessary. Here then, in the Day of Atonement, we see a glorious picture pointing to the person and work of the Lord Jesus Christ. He is our Great High Priest who intercedes for us. “Let us hold unswervingly to the hope we profess, for he who promised is faithful. And let us consider how we may spur one another on toward love and good deeds, not giving up meeting together, as some are in the habit of doing, but encouraging one another—and all the more as you see the Day approaching. (Hebrews 10:19-25). So, in future, when you are tempted to look for a scapegoat to cover up your failures or mistakes, remember you already have one. The one who willingly gave himself in your place. This entry was posted in Bible, Sermons, Theology on September 18, 2011 by Stephen Sizer.